, duchess of Newcastle, and second wife of the preceding, was born at St. John’s, near Colchester in Essex, about the latter end of the reign of James I. Her father, of whom she was the youngest daughter, was sir Charles Lucas, a gentleman of a very ancient and honourable family, and who was himself a man of great spirit and fortune. Dying young, he left the care of his children to his widow, a lady of exquisite beauty and admirable accomplishments, who took upon herself the education of her daughters, and instructed them in needlework, dancing, music, the French tongue, and other things that were proper for women of fashion. 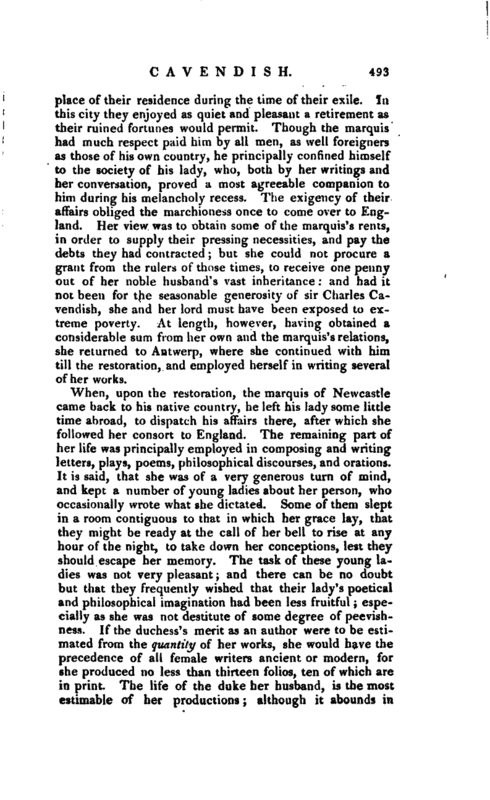 As, however, she had from her infancy an inclination for literature, and spent much of her time in study and writing, her biographers have lamented that she had not the advantage of an acquaintance with the learned languages, which might have improved her judgment, and have been of infinite service to her in the numerous productions of her pen. In 1643 she obtained permission from her mother to go to Oxford, where the court then resided, and where she could not fail of meeting with a favourable reception, on account of the distinguished loyalty of her family, as well as of her own accomplishments. Accordingly, she was appointed one of the maids of honour to Henrietta Maria, the royal consort of Charles I.; and in that capacity accompanied her majesty to France, when the queen was obliged by the civil war to quit England. At Paris Miss Lucas first saw the marquis of Newcastle, then a widower, who admiring her person, disposition, and ingenuity, was married to her at that place, in 1645. The marquis had heard of the lady’s character before he met with her in France; for having been a friend and patron of her gallant brother lord Lucas, he took occasion one day to ask his lordship in what respect he could promote his interest. To this his lordship replied, that he was not solicitous about his own affairs, as being prepared to suffer either exile or death in the royal cause; but that he was chiefly concerned for his sister, on whom he could bestow no fortune, and whose beauty exposed her to danger. At the same time, he represented her other amiable qualities in so striking a light, as raised the marquis’s curiosity to see her. After their marriage, the marquis and marchioness of Newcastle went from Paris to Rotterdam, where they resided six months, and from that to Antwerp, which they fixed upon as the | place of their residence during the time of their exile. In this city they enjoyed as quiet and pleasant a retirement as their ruined fortunes would permit. Though the marquis had much respect paid him by all men, as well foreigners as those of his own country, he principally confined himself to the society of his lady, who, both by her writings and her conversation, proved a most agreeable companion to him during his melancholy recess. The exigency of their affairs obliged the marchioness once to come over to England. Her view was to obtain some of the marquis’s rents, in order to supply their pressing necessities, and pay the debts they had contracted; but she could not procure a grant from the rulers of those times, to receive one penny out of her noble husband’s vast inheritance: and had it not been for the seasonable generosity of sir Charles Cavendish, she and her lord must have been exposed to extreme poverty. At length, however, having obtained a considerable sum from her own and the marquis’s relations, she returned to Antwerp, where she continued with him till the restoration, and employed herself in writing several of her works. But though the duchess’s literary character and works are now treated with general disregard, this was by no means the case during her own life. The most extravagant compliments were paid her not only by persons whose applauses might be deemed of little estimation, but by learned bodies, and by men of great eminence in literature. 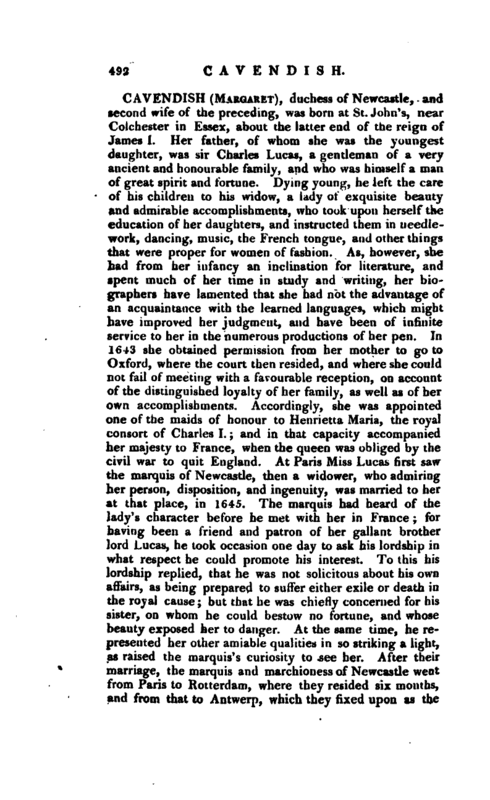 They were probably dazzled, and almost blinded by the high rank and solemn pomp of the duke and duchess of Newcastle. 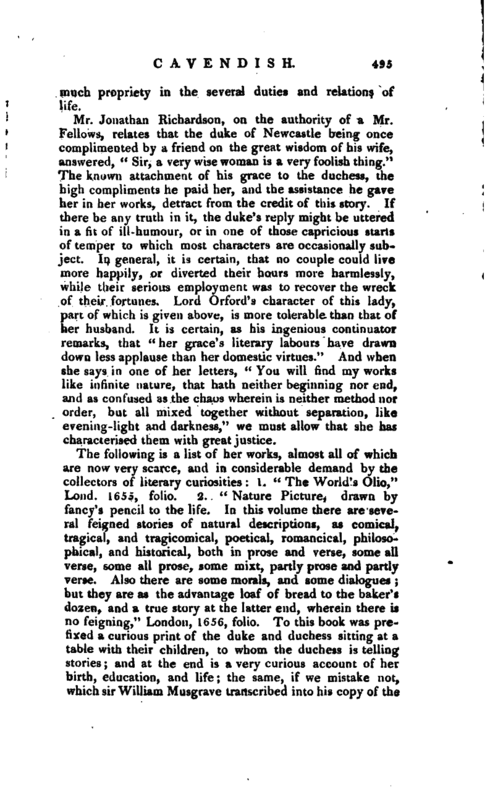 Absurd, however, as were her grace’s pretensions to philosophical knowledge, and extravagant as are her other compositions, it cannot, we apprehend, be denied that she had considerable powers of imagination and invention; and if her fancy had been enriched by information, restrained by judgment, and regulated by correctness of taste, she might probably have risen to considerable excellence. 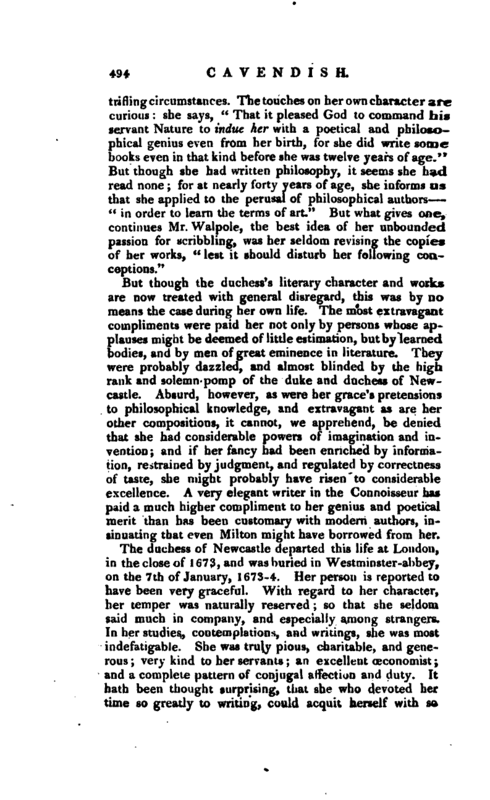 A very elegant writer in the Connoisseur has paid a much higher compliment to her genius and poetical merit than has been customary with modern authors, insinuating that even Milton might have borrowed from her. The duchess of Newcastle departed this life at London, in the close of 1673, and was buried in Westminster-abbey, on the 7th of January, 1673-4. Her person is reported to have been very graceful. With regard to her character, her temper was naturally reserved; so tha$ she seldom said much in company, and especially among strangers. In her studies, contemplations, and writings, she was most indefatigable. She was truly pious, charitable, and generous very kind to her servants an excellent Œconomist and a complete pattern of conjugal affection and duty. It hath been thought surprising, that she who devoted her time so greatly to writing, cuuld acquit herself with so | much propriety in the several duties and relations of life. Mr. Jonathan Richardson, on the authority of a Mr. Fellows, relates that the duke of Newcastle being once complimented by a friend on the great wisdom of his wife, answered, “Sir, a very wise woman is a very foolish thing.” The known attachment of his grace to the duchess, the high compliments he paid her, and the assistance he gave her in her works, detract from the credit of this story. If there be any truth in it, the duke’s reply might be uttered in a fit of ill-humour, or in one of those capricious starts of temper to which most characters are occasionally subject. In general, it is certain, that no couple could live more happily, or diverted their hours more harmlessly, while their serious employment was to recover the wreck of their fortunes. Lord Orford’s character of this lady, part of which is given above, is more tolerable than that of her husband. 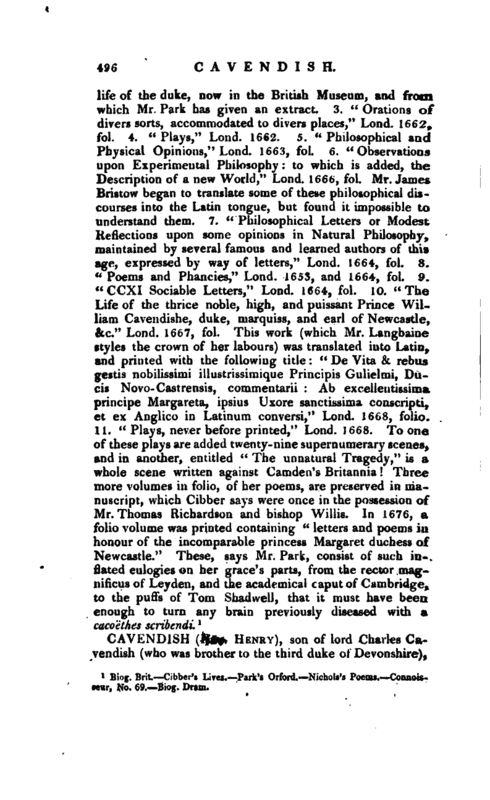 It is certain, as his ingenious continuator remarks, that “her grace’s literary labours have drawn down less applause than her domestic virtues.” And when she says in one of her letters, “You will find my works like infinite nature, that hath neither beginning nor end, and as confused as the chaos wherein is neither method nor order, but all mixed together without separation, like evening-light and darkness,” we must allow that she has characterised them with great justice. 1 Brit Cibber’g Lives. Park’s Orford, Nichols’s Poems. Connoi*­or, No. 69. Biog, Dram.